Rio Grande Valley Vipers' Julien Lewis (13) attempts a basket against the Agua Caliente Clippers' Vitto Brown (21) in a NBA D-League game at State Farm Arena Thursday, Dec 14, 2017, in Hidalgo. EDINBURG — Sitting out three full months with an Achilles injury last season and playing only sparingly when healthy, guard Julien Lewis had a quiet first year with the RGV Vipers. Still, Lewis said his mentality never wavered. That remains true for the 2017-18 season, even as he’s taken on a much more prominent position with the team. 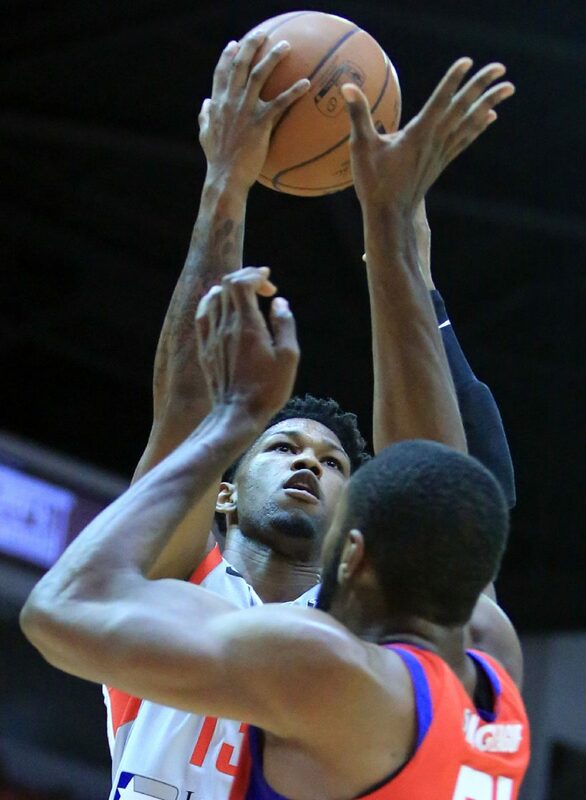 Entering a matchup with the Fort Wayne Mad Ants at 7 p.m. Tuesday at the State Farm Arena in Hidalgo, Lewis has appeared in 35 of the Vipers’ 42 games, starting 20 of them. Lewis is averaging 7.9 points and 2.6 rebounds in 17.8 minutes per game this season — all significant jumps from the 4.6 points, 1.8 rebounds and 13.7 minutes per game he averaged in just 14 appearances last year. His 3-point shooting percentage is down slightly, from 35.0 percent last season to 31.7 percent this season, but his shooting from the field is greatly improved. Lewis has hit 47.4 percent of his shots in 2017-18 compared to 36.7 percent last year. Two-way guard Monte Morris was recalled from RGV to the Denver Nuggets on Monday, and Vipers coach Matt Brase said two-way guard Markel Brown will be out indefinitely after suffering an ankle injury during Friday’s loss to the Austin Spurs. The two absences mean Lewis, nicknamed “Juice,” could play an even more prominent role Tuesday. Lewis is one of only two players, along with Chris Walker, to play for the Vipers on G League contracts both this season and last. Walker praised Lewis for getting steals and taking charges in recent weeks. Walker added that Lewis is a positive influence in the locker room, bringing levity to the squad. Lewis said he tries to take a leadership role by motivating his teammates and keeping them calm during practice. Brase said Lewis is a naturally quiet person who leads because of the effort he gives each day. Lewis played collegiately at Texas from 2011-13 before transferring to Fresno State for the 2014-16 seasons. He never ranked better than third on his team in scoring, averaging just 8.7 points per game while coming off the bench as a senior. Despite the lack of elite production, Lewis received a call from the Rockets after his college career was completed about the opportunity to try out. Now, he’s looking to rise to the highest level of the organization.